This is a new recipe I’ve came up with for my application for the Basque Stage and Sammic Rising Star Scholarship. This is a dish that has come together after going to my family Christmas party. I am part of a huge Filipino family and on Christmas, instead of having an extravagant Christmas dinner with the usual suspects as roasted turkey and mashed potatoes, we enjoy a huge table spread of traditional Filipino food. One of my favorites being, Dinuguan. For those who are not familiar, Dinuguan is a stew made of pork (usually including intestines) cooked in its own blood with vinegar and peppers. It is also known as ‘chocolate rice’ or ‘black rice’ too make it sound a little more appetizing to the audience. I wanted to put a twist on the traditional dish, so I have decided to combine it with a very traditional Spanish dish, calamares en su tinta, calamari in its own ink. With the huge Spanish influence in Filipino culture, these two dishes come together to make something that just makes sense. 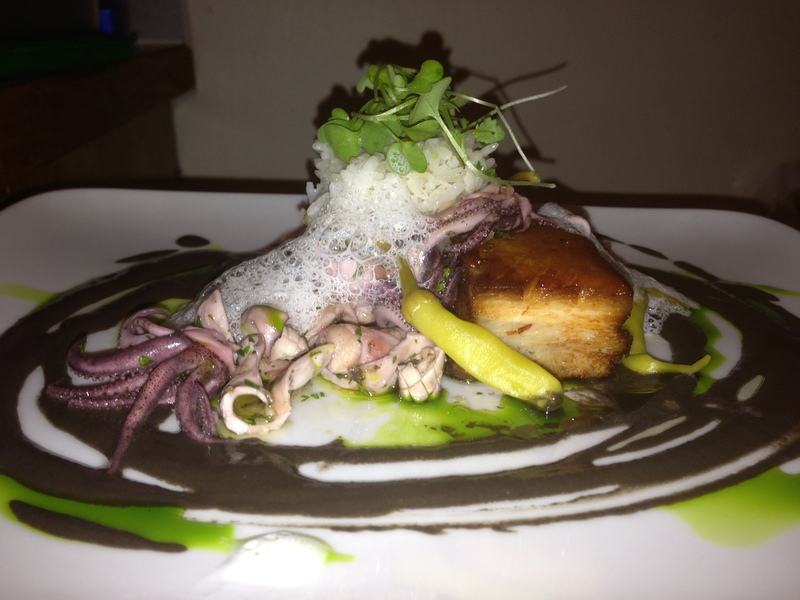 My interpretation of this dish has pork belly that has been braised with sherry vinegar and stock. 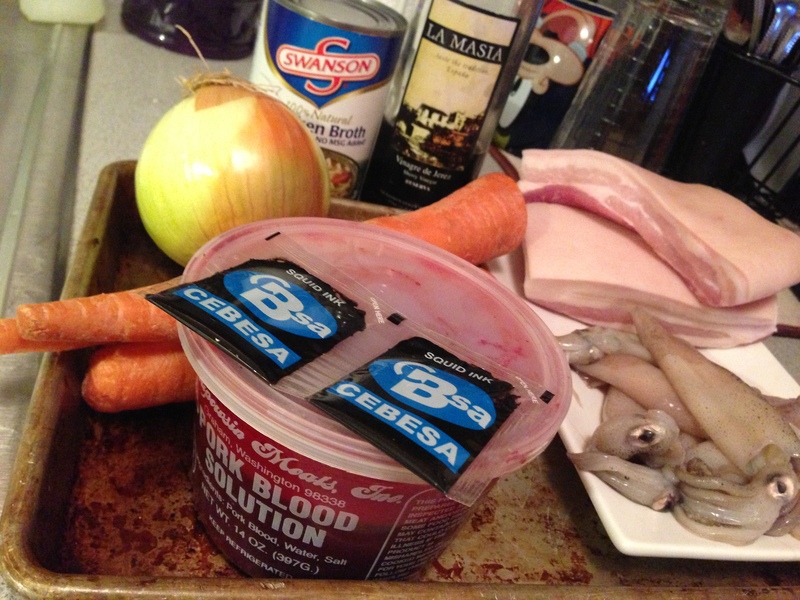 The sauce is then combined with the pork blood to make the infamous lip-puckering and savory sauce. I incorporate the squid ink into the sauce too help deepen the black color of a sauce and also to add another depth of flavor (umami) to the vinegary sauce. I then sautéed the calamari and toss it in a simple olive oil and garlic vinaigrette. 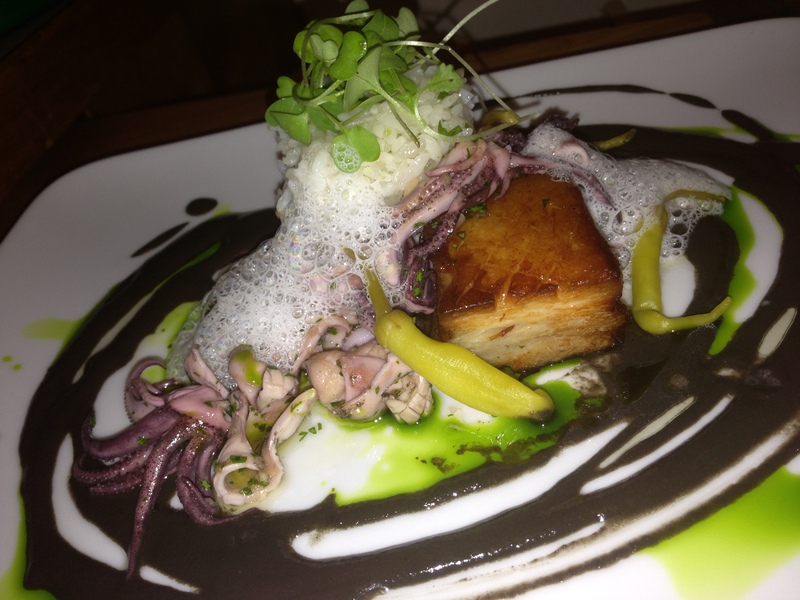 The calamari adds a great textural contrast to the fatty and rich pork belly. Garnish it with a foam of garlicky alioli and have substitute piparras peppers instead of thai chilies to help balance with the richness of the sauce and the pork. Sear pork belly until brown on each side and add to pot with carrots, onions, garlic, sherry vinegar and stock. Braise at low temp until tender. Remove pork belly and strain liquid and reserve. 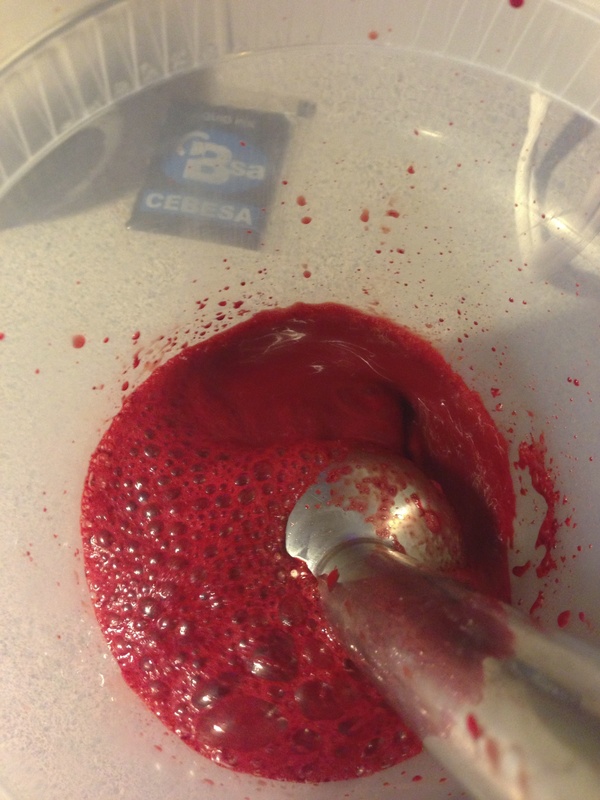 Blend pork blood so it keeps from coagulating in the stew. Sauté Carrots and onions until tender and add squid ink. Cook for a minute and then add pork blood and cook for another minute. Add braising liquid and let sauce cook down for an hour to let flavors develop. Purée until smooth and then pass through a sieve. Sear calamari on high heat, weighing it down with a pan pressed on top, until cooked through. Slice into smaller pieces and then toss in a marinade of olive oil, garlic, salt, and parsley. Sear braised pork belly until crispy and warm through. Place steamed rice on plate with the blood-ink sauce. 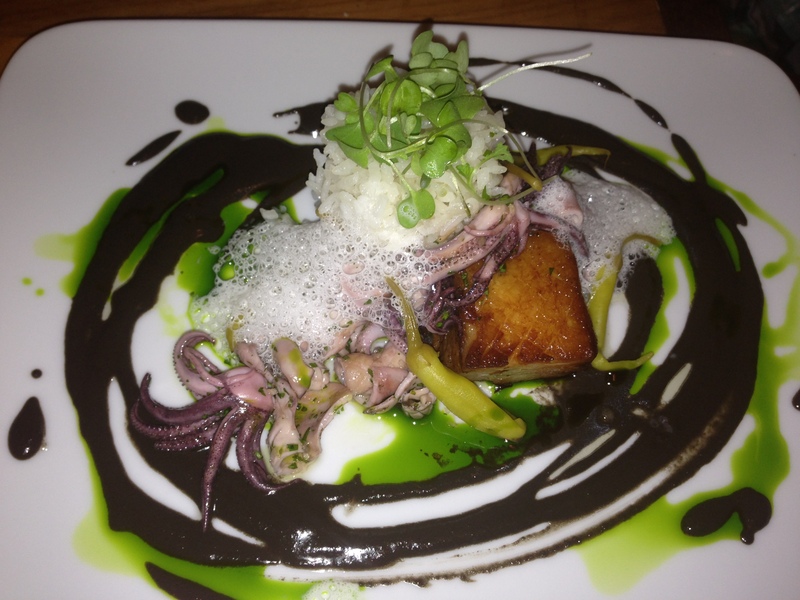 Place pork belly and Calamari over the sauce and garnish with aioli foam, pippara peppers, and parsley oil. This dish is a representation of my love for Spanish and Filipino cuisine. I am really happy with the outcome of this dish. The blood-ink sauce had all of the characteristics of the flavors of Dinuguan but with the added squid ink, it had brought another dimension to the sauce that just enhanced the sauce. The pork belly had a vinegary kick to it that really balanced it out with the fattiness of the cut and paired perfectly with the tender squid. Overall, I think that this is a recipe that I will have to keep in my repertoire!